There are no direct flights from the UK to New Orleans. Airlines offering flights to New Orleans through their respective US hubs include American Airlines, Delta, United and US Airways. 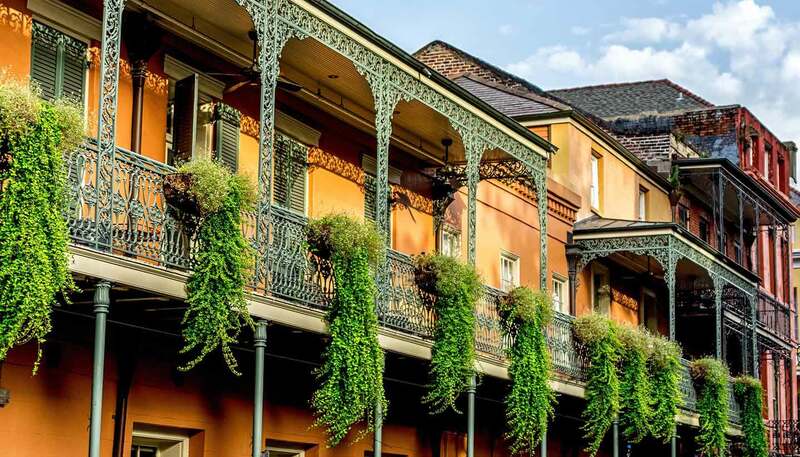 It's more or less a year-round destination, so it can be tricky to find cheap flights to New Orleans, though if you travel during the off-peak summer months, when it’s hot and humid, you may be able to find a bargain. From London - 12 hours 30 minutes (including stopover); New York - 3 hours 30 minutes; Los Angeles - 3 hours 40 minutes; Toronto - 5 hours (including stopover); Sydney - 19 hours (including stopover). In Louisiana, the minimum age for driving is 16 years and cars drive on the right. Speed limits are generally 48kph (30mph) in town, 88kph (55mph) on highways and 105kph-121kph (65-75mph) on the interstate highways, unless otherwise posted. Louisiana has strict laws against drinking and driving, and open containers of alcoholic beverages are not permitted in vehicles. Drivers may turn right at a red light, after a complete stop, if the way is clear. A flashing red traffic light is the same as a stop sign, which means that it is necessary to come to a full stop and proceed when safe. All valid national licences are acceptable; however, your car hire company may require an International Driving Permit if your licence isn't in English. US insurance is mandatory and available from car hire companies, but it is costly so check to see if your insurance covers car hire. The American Automobile Association (AAA) (tel: +1 800 222 1134; www.aaa.com) can provide information, and may offer reciprocal benefits to members of automobile clubs in other countries. I-10 heads west to Houston (Texas) and Los Angeles (California), and east to Mobile (Alabama) and Jacksonville (Florida). I-55 heads north to Memphis, St Louis (Missouri) and Chicago. I-59 connects New Orleans to Birmingham (Alabama) and Chattanooga (Tennessee). Note that the exit for the French Quarter is marked 'Vieux Carré'. Greyhound buses (tel: +1 800 231 2222; www.greyhound.com) arrive at the 24-hour Union Passenger Terminal, 1001 Loyola Avenue, which is shared with rail services. There are frequent services from New Orleans to Baton Rouge, Lafayette, Memphis and Mobile. Megabus (tel: +1 877 462 6342; www.megabus.com) runs coach services from the same terminal to major cities in the region, including Atlanta and Houston. From Jacksonville - 8 hours; Los Angeles - 27 hours; Mobile - 2 hours 30 minutes; Baton Rouge - 1 hour 30 minutes. Trains in New Orleans arrive and depart from the Union Passenger Terminal, 1001 Loyola Avenue. New Orleans is the terminus for the City of New Orleans service from Chicago, Illinois via Memphis, Tennessee; the Crescent service from New York City via Atlanta, Georgia; and the Sunset Limited service from Los Angeles, California. Amtrak (tel: +1 800 872 7245; www.amtrak.com) is the national railway provider and its service is generally good, if not reliably punctual. From Los Angeles - 46 hours; Chicago - 19 hours 30 minutes; New York - 30 hours.